Murine Eimeria spp. have been used as effective experimental models of disease instead of large mammalian hosts such as cattle. 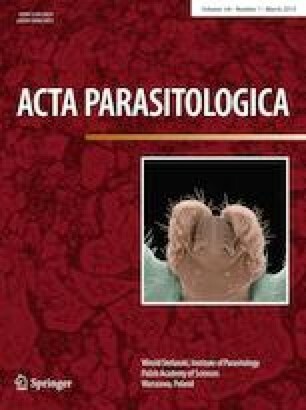 We here examine drug susceptibility of the uncharacterized murine intestinal protozoan parasite, Eimeria krijgsmanni. The effectiveness of different treatments against infection of E. krijgsmanni was examined for suppression of oocyst shedding: ST mixture ST mixture, pyrimethamine, Ektecin and toltrazuril. ST mixture and pyrimethamine did not suppress oocyst shedding effectively. Although therapeutic efficacy of Ektecin was demonstrated, the dose required was larger than that for cattle and chickens. Oocyst shedding was only completely suppressed completely by continuous administration of toltrazuril. Furthermore, it was confirmed through morphological examination that early developmental stage zoites appeared in host epithelial cells during and following treatment by toltrazuril, and toltrazuril could not eliminate residual zoites in epithelial cells. E. krijgsmanni may be relatively resistant to these anti-coccidian agents and might therefore have different characteristics that differ from other coccidia with regard to drug susceptibility. This work was partly supported by Grant-in-Aid for Scientific Research from the Ministry of Education, Culture, Sports, Science, and Technology of Japan (Nos. 16K08025 and 16H05803).